This article originally appeared in the September 2006 issue of Municipal World. It chronicles the Placemaking process in Mississauga, Ontario, where PPS worked with public agencies and community stakeholders to help create great public places in the city's civic center. The year 2006 marks the tipping of the scales between the planet's urban and rural populations. At some point in the very near future, more people will be living in cities and suburbs than in the countryside for the first time in history. If we don't reverse this civic distrust, then soon our cities and towns will be more populous, but not worth inhabiting. Though closer together by some measures, we are suffering from what sociologist Robert Putnam calls the loss of "social capital." Our connections to neighbors and fellow citizens, the glue of a democratic society, are being undone by streets that favor cars at the expense of pedestrians, public institutions that detract from the vitality of surrounding districts, and commercial developments that stimulate consumerism but not social interaction. If people can't come together in public spaces, if streets have no room for neighborly conversation or casual sidewalk contacts (what Jane Jacobs called "the small change from which a city's wealth of public life may grow"), then what future is there for a shared civic culture amid the rapid demographic changes affecting today's cities? The good news is that "the instinct for human encounter" has not left us, it has just been suppressed. We can create a culture of civic engagement, and public spaces are perhaps the best forum in which to do so. People still want to come together as a community in their shared spaces. Our parks, streets, squares, and public buildings can still foster civic ideals like democratic participation and cultural expression. It's simply a matter of enabling people to use these places as they are naturally inclined. But first, if the desire for human contact is to express itself freely, local governments must adopt a new approach to designing and managing the built environment. 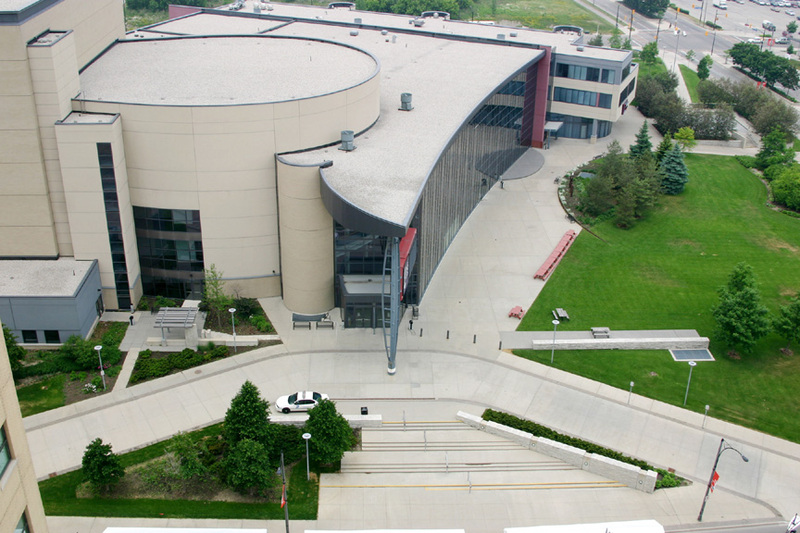 In Mississauga, Ontario, the Living Arts Centre is one of many institutions that has the potential to bring more life into downtown's public spaces, if it becomes a destination, and not just a facility. Mississauga, Ontario is one of the pioneering cities exploring how to revive civic culture in public spaces. With nearly 700,000 residents, Mississauga has rapidly grown to become Canada's sixth largest city, yet it has struggled to escape the shadow of neighboring Toronto and establish its own identity. The downtown area possesses great potential, with the City Hall, Central Library, and Living Arts Centre all located closely together. Until quite recently, however, the public spaces around these buildings lacked street life, reinforcing the attitude that Mississauga is a sterile suburb with a shopping mall at its heart. Today that perception is beginning to change, as the City makes a concerted effort to create a genuine, cohesive civic center full of public activity. "The City is looking to local residents, businesses and key stakeholders to help shape Mississauga's City Centre into a vibrant downtown area," said longtime Mayor Hazel McCallion in a recent interview. "The City plans to develop a City Centre that will be the major focal point for commercial activity, employment opportunities, cultural, civic, recreational facilities and residential development." Making this vision a reality depends on using the right process. When Mississauga began their revitalization effort, the first thing they did was train over 200 city staff, including the City Manager and all the Commissioners, in the intricacies of what makes a great place. Why? Because when your goal is to create a place, you do everything differently. Normally, for instance, traffic engineers concentrate on moving vehicles, and park managers focus on maintenance, landscaping, or security. But if making a place that attracts people and gives them joy becomes the number one priority, then new questions arise. What uses would draw people to this place? How can you design the street and manage the park to support this activity? Possibilities emerge for increased collaboration between city planning professionals. Using public spaces as venues for markets or performances, for instance, may mean that departments of economic development or cultural affairs also become involved. In fact, creating a place requires more skills than any one discipline can possibly provide. Going hand in hand with the wisdom of using a multi-disciplinary, place-based strategy is the need for a bottom-up, community-based approach. Put simply, if you want to create places that work well for the people who use them every day, then civic engagement must be built into the planning process itself. That means giving the local community a pivotal decision-making role, using their expertise and aspirations to guide the evolution of their public spaces. The result is a public realm that not only incorporates local character and citizens' wisdom, but also instills a sense of civic pride and stewardship in the community. People feel more connected to a place if they or someone they know had a hand in shaping it. Even without a direct link, just knowing that fellow citizens played a role can make a huge difference in people's perceptions. In a diverse city like Mississauga, where 47 percent of the population was born outside Canada, fostering community involvement from the outset is especially important, requiring thoroughness and sensitivity. Like an increasing number of cities, Mississauga is home to many distinct ethnic communities, each with distinct hopes and desires for their public spaces. Including a broad representation of stakeholders in the planning process ensures that the uses and activities within each place are geared to multiple audiences. The public realm becomes more eclectic and democratic, acting as a forum for cross-cultural communication. After Mississauga's city staff completed the training, they worked with groups of local citizens to evaluate the public spaces in the City Centre and suggest improvements. Ideas ranged from physical changes, like making streets and sidewalks more pedestrian-friendly, to new events, like ethnic festivals and markets. The benefits of the community-based process were clearly apparent in the ingenuity and enthusiasm of the participants. Their ideas are now the template for infrastructure enhancements and a new program of activities for the City Centre. 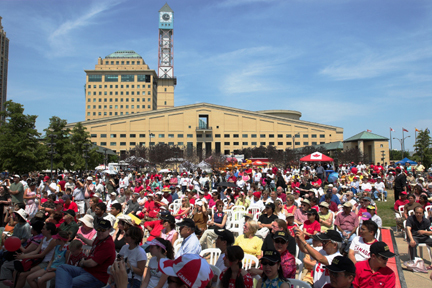 A crowd gathers for a concert, one of many events held during "My Mississauga," a series of events held last summer. This approach to city planning necessitates a new way of organizing government. It not only involves getting diverse stakeholders to the table to talk about change, it also depends on continuous communication between all parties--both during implementation and afterward, when management is of paramount importance. "We need to keep asking the community what they like, what they don't," says Gil Peñalosa, leading staff advocate for Placemaking in Mississauga. "It always requires political support, staff support, and especially, community support." Mississauga has risen to the occasion by creating a new initiative called the "City for the 21st Century." The director of this division, Bruce Carr, is currently managing the Placemaking improvements to the City Centre as outlined by the community. This summer the Central Library and City Hall plazas were actively programmed six days a week, hosting an eclectic mix of concerts, ethnic festivals, markets, sports, and other activity. Another way the City has adjusted is by treating public spaces as outdoor community centers. Mississauga already operates a network of indoor community centers with budgets for management and programming. They are beginning to operate public spaces the same way, as places that need continual management to succeed. In kicking off this summer's festivities, City Manager Janice Baker announced, "Today is an exciting day for the City of Mississauga. City Centre is about to be transformed into a unique 'outdoor community center' where we can all enjoy live concerts, food, activities, and special events." The City's 2007 draft budget sets aside funds for a full-time city center management staff, the first time the city has created a position to manage an outdoor space. If successful, the model could be replicated in other public spaces, including Mississauga's waterfront park system along Lake Ontario and the Credit River. Mississauga's commitment to Placemaking bodes well for the future of civic engagement -- there and elsewhere. By creating successful public spaces with real community participation, they have taken a very forward-looking and courageous step, one that we'll see replicated in other cities before too long.